The Smallmouth Bass or Micropterus dolomieui is one of the best pound for pound fighters in the world. It is also called the Bronzeback, Brown Bass, or Bronze Bass and is sometimes confused with the Largemouth Bass. This freshwater fish is found throughout North America and is a extremely popular sporting fish, known for its jumping ability and never say die attitude. They get their name from the fact that the rear end of the lower jaw does not extend past its eye unlike that of the Largemouth. 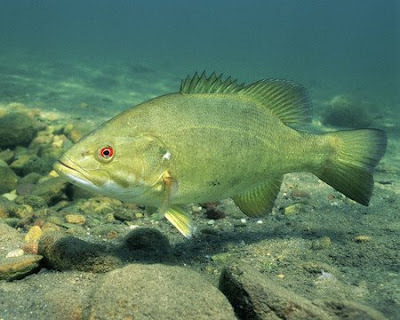 The Smallmouth Bass is often found in rocky areas or other locations where it can lay in cover. It prefers temperature that are cooler than that of the Largemouth Bass. This fish feeds on smaller fish, crayfish and unlucky insects trapped on the waters surface. Not only is the Smallmouth Bass a great catch, but it is very tasty too! Most people considered it to be much better than the bigger Largemouth Bass. The Smallmouth Bass can live up to 13 years and the largest Smallmouth ever caught was 11lbs 5oz! I bet that was one hell of a fight. If you have any Smallmouth tips or recipes feel free to leave us a comment.